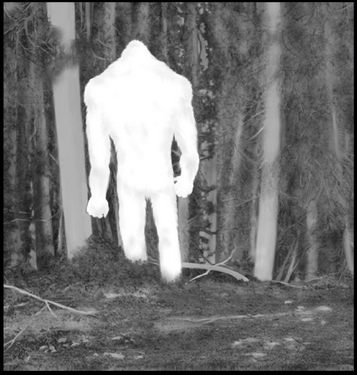 Here is the sighting by Bart Cutino of the BFRO using a thermal imaging unit. The sighting is well documented and scores a 9. ^^^^^ Keep in mind that the above image is not from thermal imaging equipment. It is artwork by Mr. Cundle. If anyone wanted to read a report with some very out of the ordinary details, this one qualifies. True. And some of them don't even make any sense, like the breast stroke or the hand in the air (had to laugh at those recreations). I hate to say it but needing to do recreations when you have the gear available but not used, means a screw up occurred. Admittedly I have been guilty of that myself more than once. You never know at what instant during field work you will have an encounter. One of these was when I was carrying a new digital recorder that I had not used enough to quickly get it recording. That is simply not forgivable. I should have played with it at home enough to know the gear. Another happened about 30 seconds after I parked my truck at a trail head. Who would think something would happen that quickly, but it did. I suppose the problem with BF field work is that you may be out 100 times between happenings and you get lulled into complacency. Bart is a good friend of mine and does work with our group here in WA, his experience was not recorded due to tech limitations. The unit he was using did not have on board recording ( believe it was a L3 Thermal Eye model ) and required a massive power rig system to power and external AV out footage to the DVR ( weighed close to 20 LB ). They did have the system but could not get it connected in time to get what he was viewing on thermal recorded. He now has a far better unit with on-board recording and a longer battery run time. He and I have sat an talked for hours about what kind of footage he would have had if he had gotten the system up and running, third time is the charm I am going to assume. One thing this report and others I have read, is the fact that it seems a BF without adequate tree cover will go to the ground in a flash. It seems instinctive and sort of suggests that they as a species have not been bipedal all that long. Or they could know, that in areas where the trees to hide behind are lacking, during half the year where ground vegetation is flourishing, ferns and bushes provide plenty of cover if they just get down on all fours. I find myself expecting them to be walking around when that may not be the case with humans in the area. His report and encounter are why I get a decent thermal unit last year. I think it is a game changer and helps to level a playing field at night that tilts entirely in the favor of a sasquatch. It goes with me during the day too. Pretty amazing how easy it is to hide in the shadows of the forest by day. You would walk by and nothing would catch you eye. Not any more. This is the first time I have read it .